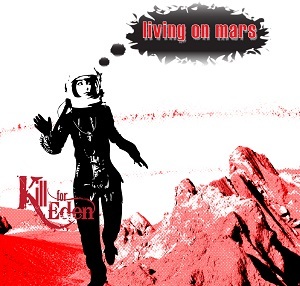 Kill for eden released their excellent debut album earlier this year, and are now following it with an EP - Living on Mars. To be more accurate, it's actually a single as the title track is taken from the album. Alongside the title track are two new songs - "The dome" and "Shoot me". Kill for Eden are based in London but with members from Australia, Italy and Russia they really are an international band. If you've already got the debut album then you'll already know the title track "Living on Mars". It's a great song with plenty of mainstream appeal but with enough power and heavy guitar riffs to be heavier than the average mainstream rock song. "The Dome" takes it's lyrical inspiration from the Stephen King story "Under the dome". It starts quite slow and gentle with soft vocals and gentle guitar before all hell breaks lose as Lyla unleashes the power of her vocals and the band kick it up to high gear. This pattern is repeated a couple more times during the song - soft and gentle then loud and heavy. It works really well and it's a great song. The last track is "Shoot me". Once again it's another great track with some great vocals and round soff the release nicely.